My First Show of the Season! Just a quick post to let you know that I will be participating in the GlassAct! 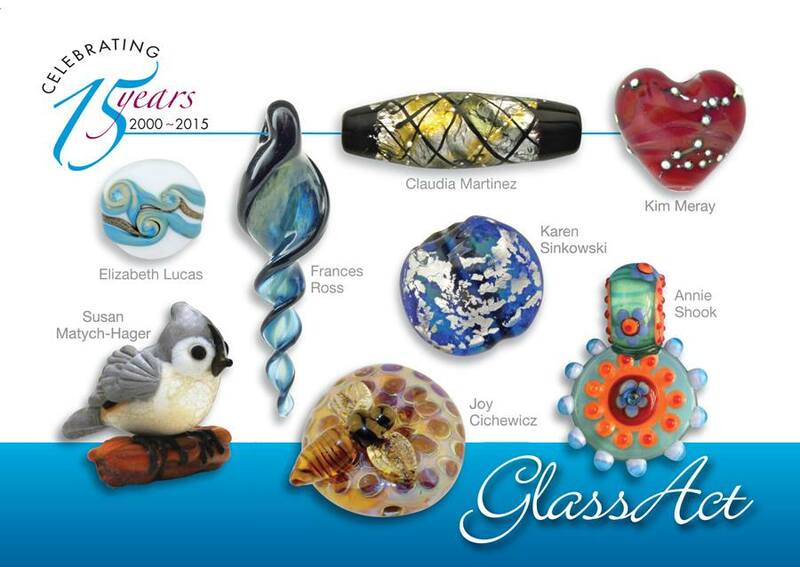 Trunk Show at Stony Creek Beads in Ypsilanti, Michigan this weekend; Saturday, September 19, 2015 from 10 am to 5 pm. Not only is this a fabulous bead shop with tons of inspiration and awesome beads, my glass group is a talented batch of glass bead makers. 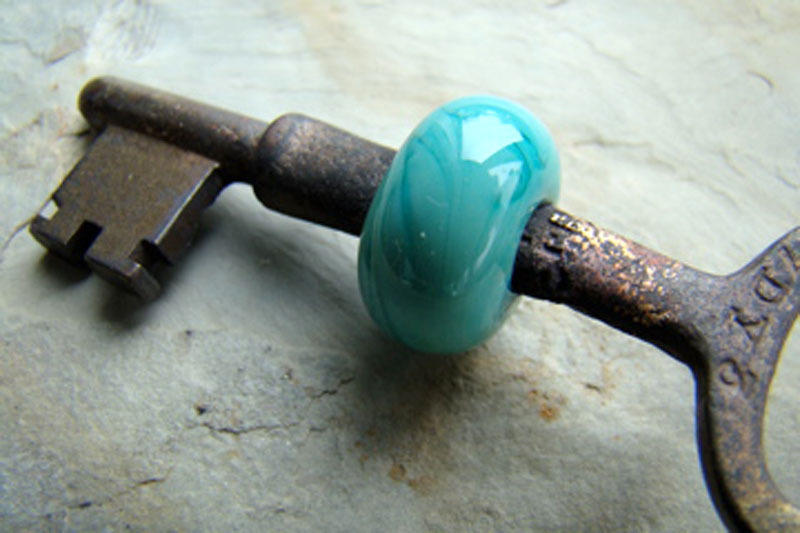 Our one-day show will showcase some incredible glass beads, pendants, and other glassy stuff (yes, I'll have fused glass buttons too) for sale - to arty jewelry makers and creative types. Sometimes you just need a quick win. It seems like everything I make is a months-long project (some times years-long, but we won't go there). 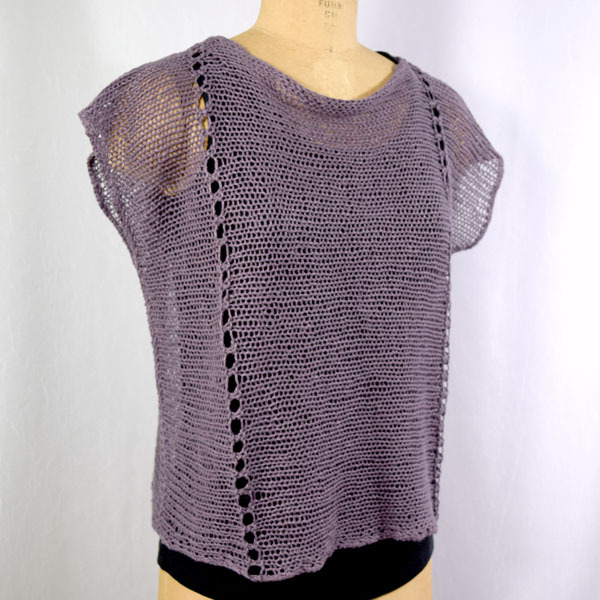 This little Linen Top by Kat Coyle popped up in my Ravelry browsing and I had to try it! Knit in Louet Euroflax Sport on a size US 10 needle (6.0 mm) from side to side. 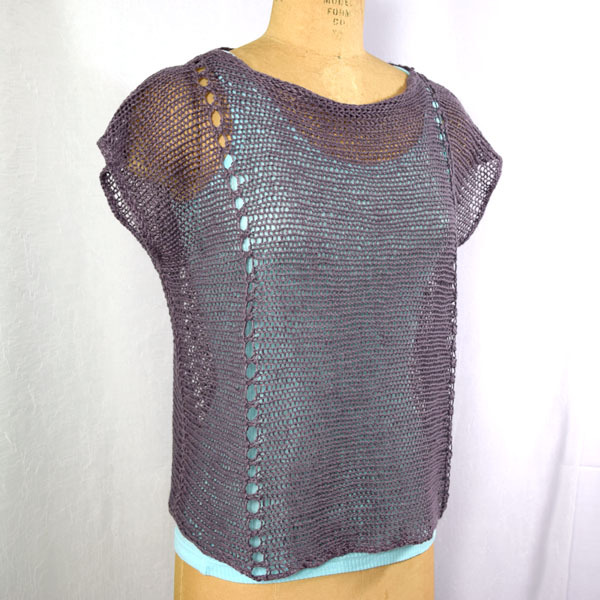 The eyelet ridge is an easy way to add a lacy look and the knitting was fast and easy. I crocheted the seams and crocheted around all the edges for a more finished look. Kat's pattern is a one-size fits all style but I know from experience that one-size is always too big on me. I made some minor modifications to the dimensions to make it a bit longer (21") and narrower (22") and the result is perfect. I could't be more pleased with the style and fit. It also feels comfortable to wear and goes great over a ton of different colors. Summer tanks or winter long-sleeved T's. Its a good thing linen wears and washes like iron because this one will be worn a lot! Actually, this yarn has already earned it keep. 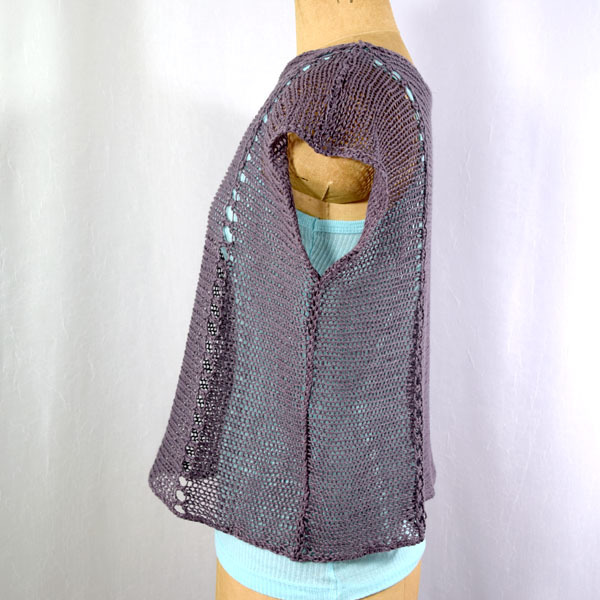 I bought it a few years ago and made a simple triangle shawl with it. I loved the deep, smokey plum color and just wanted something out of it. But, shawls are not my thing and I might have worn it once. It has been tucked in a drawer - unloved. 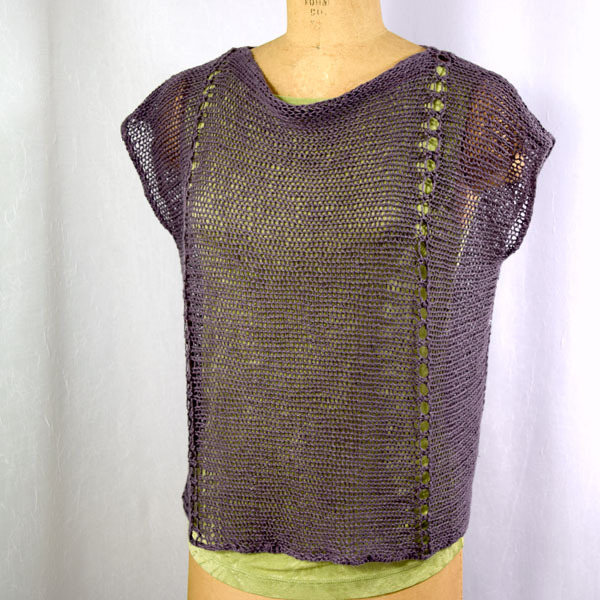 When considering the price of linen for this adorable top, I remembered the unworn shawl - 2 skins of linen, just what I needed. I frogged it, washed it, balled it up. The perfect solution! There is nothing more satisfying than a successful project. Would't it be nice if they all worked out that way? What was your most successful project? 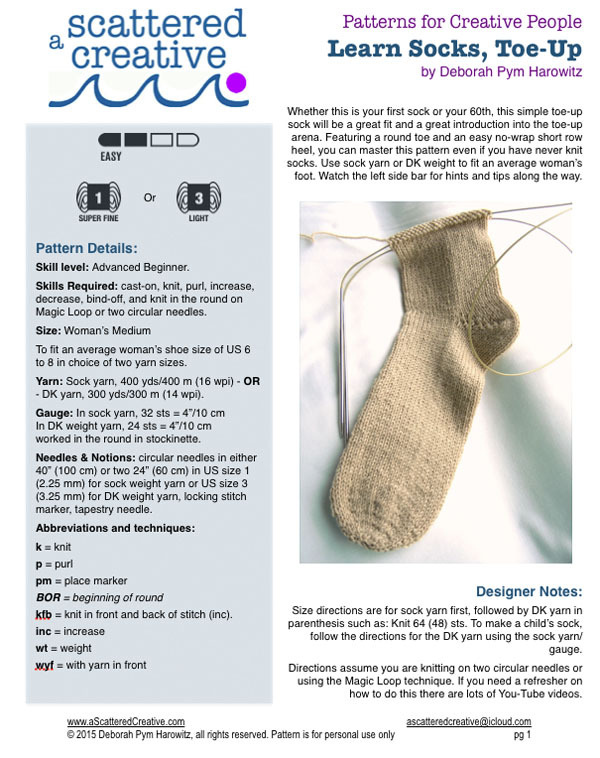 My Sock Pattern is Live! And no lightening was required! My first self-published pattern is now for sale on Ravelry as a digital download. Or on Etsy as a printed paper copy. I'm very proud of the finish product and hope to have another pattern out soon. So many are swimming around in my head! I'd love to hear what you think and if you knit them, send me a photo for the pattern's companion page! So, I decided it was time to pretty-up the patterns and publish them formally. To that end, my first class in the series is a "Learn to Knit Socks, Toe-Up" and the pattern, called Learn Socks, Toe-Up, is about ready. 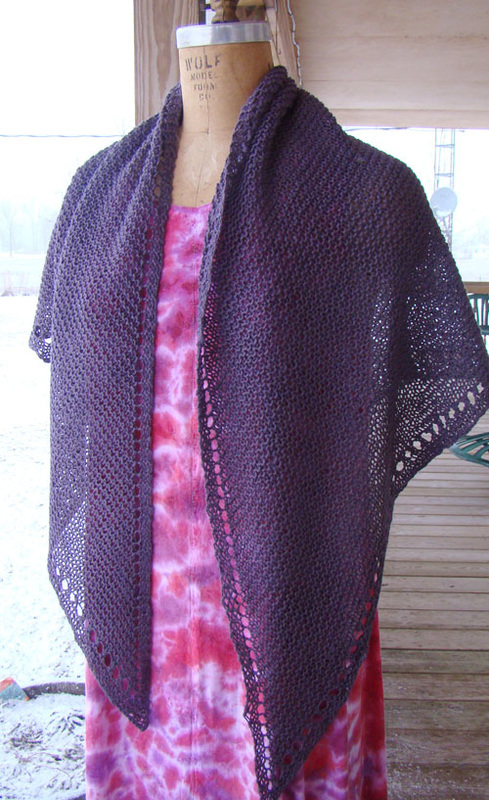 It should launch the last week of August (2015) and I'll have it available for purchase on Ravelry and Etsy. It is also my first solo pattern (self published) and I've learned some things along the way I'd like to share. It's amazing to me, how many patterns have errors in their numbers, or instructions out of sequence. When you are editing and correcting and re-thinking the way you explain something, it is really easy to get it all screwed up. Especially when your head starts swimming with all those numbers! I took some advice from the publisher of my Dragon Paws pattern and hired a tech editor. What do I have to say about this experience? Jae of Some Knitting Required is worth her weight in gold!!! I am so grateful for her expertise! The things I learned about how other knitters process instructions was also invaluable. Little stuff I never thought of came to the surface. The local testers from my local fiber group was a huge help and the Free Pattern Testers Group on Ravelry was awesome! You may be thinking that this all sounds too expensive, after all pattern designers don't make a ton of money on their patterns But it's not that bad, the test knitters are free, you just provide them with a pattern (and in some cases the yarn) and a little time. A good tech editor is able to do her job in an efficient amount of time and therefore her rates are not crippling.The end result of all these eyes on my words and knitters following my directions is that the pattern launch for my Simple Toe-Up Socks pattern will be a product I can be very proud of and my customers can follow without frustration (at least caused by me ). And an added bonus of the process, I have run across some great references online that can be useful to sock knitters. A great knitting needle size conversion chart for US sizes to metric is always helpful. The best one I found was on Wikipedia, of all places (make sure to scroll down to the chart). And the best shoe size conversion chart from US sizes to UK and European sizes can be found on Zappos - they also have great shoes, just so you know. I've added these resources to my Tips, Hints & Help page so they are easy to find.